Jon Else worked on the SNCC staff in 1964 and 1965. He was series producer and cinematographer for Eyes on the Prize, has produced and directed many award-winning documentaries, including The Day After Trinity and Cadillac Desert. A recipient of a MacArthur Fellowship, he is a professor at the University of California at Berkeley Graduate School of Journalism. 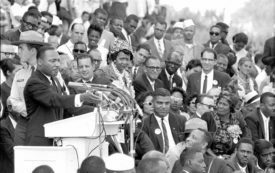 His new book is True South: Henry Hampton and “Eyes on the Prize,” the Landmark Television Series That Reframed the Civil Rights Movement.